Home features 4 bedrooms, 3 full baths, Formal Dining Room, Office - Living Room with fireplace... Large Backyard with Wood Privacy Fence and storage building. Home was built in 2004 and very well taken care of. 2250 ht.sq.ft. and priced to sell at only 200K! Call, text (479-236-3457) or EMAIL NICKY DOU for more info. 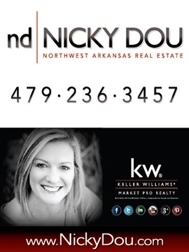 or to schedule a tour of this great home for sale in Bentonville, AR!